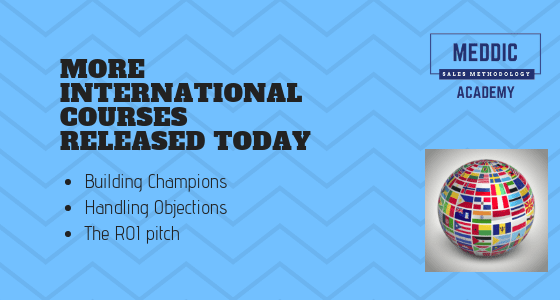 In another course, entitled “CHAMPION” which is part of the MEDDIC bundle you learn who the champions are and why it is so important to know them and work with them. 95% of sales persons don’t handle objections properly. Most sales people naturally feel somehow attacked and react by defending their product or their solution. That’s a wrong approach. During this course we learn a proven method applicable in any sales process from an inexpensive consumer product sold in the street up to a multi-million dollars contract. When you understand the mechanism of a proper objection handling and manage to make this process a habit, then you’ll close most of the deals thanks to a client objection. Attend the course now and learn! Non-financial reps learn how to leverage the value of a product/service to shorten the sales cycle, justify the price, avoid discounts and create a sense of urgency and a compelling event –> “When you don’t buy my product, you lose money each day”. You can find all our French language courses here.